Regular readers of La fashion folie will know I have a slight obsession with all-things neon. 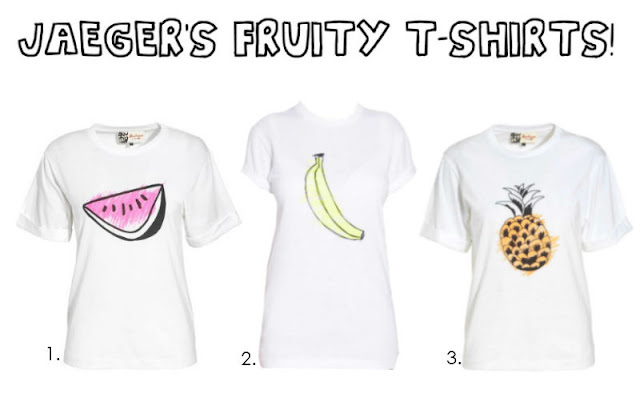 So you can imagine how excited I was when I came across these fabulous fruit-print t-shirts in the Boutique section of Jaeger today, complete with on-trend highlighter pen scribbles. The only downside? Choosing which of the cute prints to plump for! I finally decided on the melon print, on the basis that neon pink is more wearable than orange or yellow. My only hope is that I won't be on the receiving end of too many 'nice melon' puns, but when my t-shirt is this fabulous, who cares?! 2. Banana print t-shirt, £40. 3. Pineapple print t-shirt, £40.